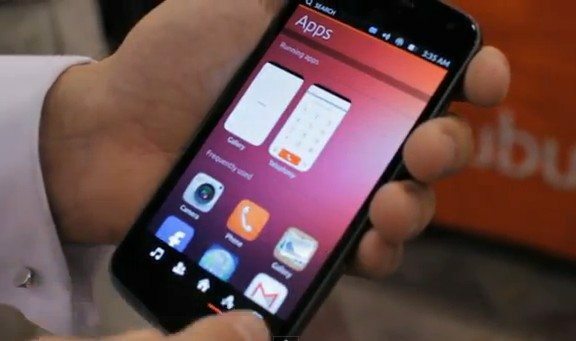 There seems to be quite a bit of buzz surrounding the new Ubuntu phone, and during the CES 2013 event in Las Vegas, Canonical showcased a pre-release version of the mobile Ubuntu operating system running on an Android device, and the company is pitching a full computing ecosystem rather than revising Linux for phones. According to an article over on Cnet, Canonical’s pitch includes the full desktop version of Ubuntu, the smartphone, and a desktop dock, and furthermore the founder of Canonical, Mark Shuttleworth was at CES 2013 to give a demo of the Ubuntu smartphone operating system in action, and we have a video of that demo for your viewing consideration below. In the footage Shuttleworth shows off what it is like to navigate the Ubuntu operating system, browsing through several native apps and system features, so don’t forget to mash that play button to check it out in action. The firm has said they expect to offer Ubuntu on a mix of high end and low end handsets, with specifications running as low as a 1GHz dual core Cortex-A9 processor and 512MB of RAM, and the handsets are expected to become available sometime late this year, but the company hasn’t stated which companies will be manufacturing the hardware or which networks they will be partnering. The company is also making changes to the Android interface whilst there are some aspects that remain the same, although app icons are larger and Ubuntu handsets take advantage the the screen edges with gestures to activate app switching and access content. Although the Ubuntu phone OS is based on Linux, and is open source just like Android, it does look fairly different to what both Google and Apple offer in smartphone interfaces, with the demo smartphone not having any buttons and using a carousel for options along the top of the device where the user can see their images or organise the images by event. Anyway enough from me, I’m sure all you really want to do is head on down and check out that Ubuntu Phone video, so get to it and enjoy, but we would love to know if any of our readers would like to own a Ubuntu phone when they start to become available. Interesting. I assume it will come with default hardware expectations, i.e. Bluetooth. Any statement as to which iteration of BT is intended? Also, random observation, coming from working in a tech support environment, generally speaking, buttons are pressed or tapped, potatoes are mashed!